My husband makes fun of me because I shower before I go to the gym for my workout classes. My response–“Would you want to be the person exercising next to me once this stink warms up?” I know, TMI (that stands for “too much information” for those of you who have problems with acronyms like I do), but bear with me, I’m sure you’d agree that some odors are just not good warmed–even “Christian” odors. Not everyone enjoys even God’s fragrance. 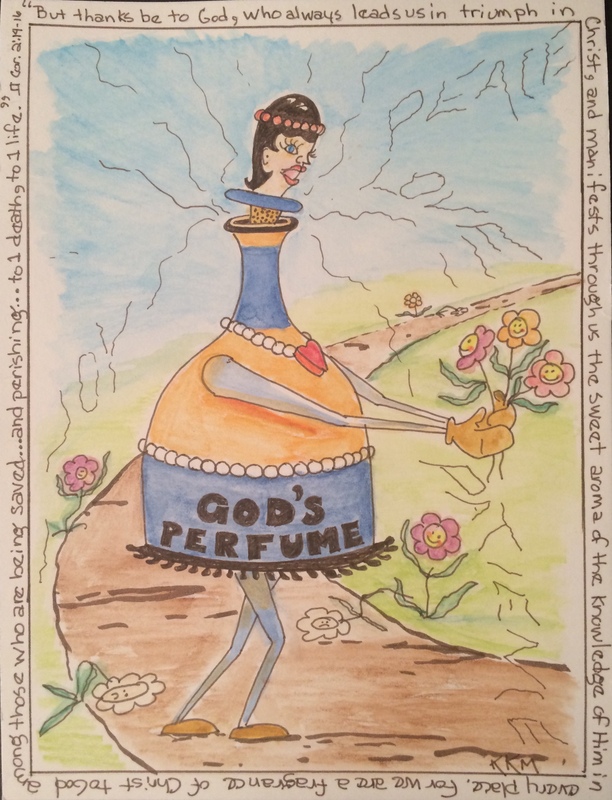 Interestingly, it’s not others we should be concerned about, regarding our ‘odor’ that is, it’s God. When I look at this doodle from last year I am still struck by the idea that even though we may be permeating love, joy, peace, patience . . . we can still be offensive to some. Like the verse says, “But thanks be to God, who always leads us in triumph in Christ, and manifests through us the sweet aroma of the knowledge of Him in every place. For we are a fragrance of Christ to God among those who are being saved and among those who are perishing, to the one an aroma from death to death, to the other an aroma from life to life. And who is adequate for these things?” I know I’m not adequate to judge these things! ← What’s Behind Your Back?